Take a paper plate and spread the carom seeds evenly on it. Place this paper plate in microwave oven and microwave on high power for few seconds (30 to 40 seconds) till the seeds start spluttering. Remove the seeds from oven and cool a bit. Take the carom seeds into a mixie jar and grind them to a fine powder. Take a fine sieve and sift the carom seeds powder to get fine powder. In a bowl take salt and add sifted carom seeds powder and red chili powder and mix well. The spice powder is ready to be mixed with the Budam Baddalu. 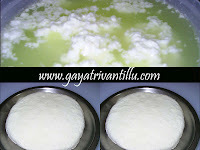 Wash the Budam kayalu and spread them on a clean cloth to dry completely. When they are dry, cut the end portions and cut each Budam kaya into four pieces vertically. Arrange the cut Budam pieces in plates side by side. While cutting see that the seeds remain intact with the pieces. However, some seeds separate while cutting the budam kayalu. Take the seeds in a plate. Place these plates in sun and dry the pieces for 6 to 7 hours. Morning if you cut the pieces let them dry in sun till evening. Also dry the seeds in sun. The seeds try to separate from the pieces because of the moisture content in the pieces. Drying the pieces in sun for 6 to 7 hours, the pieces hold the seeds as they get shrunk. To keep the seeds intact with the pieces it is necessary to dry the pieces in sun for 6 to 7 hours. In olden days the pieces were taken in a bowl and mixed by hand after adding salt, red chili powder and carom seeds powder. Salt brings more moisture out from the pieces. In this process the seeds get separated due to excess moisture in the pieces. After sun drying the budam baddalu and frying in oil there used to be the shells only which will not taste good without the seeds. So to retain the seeds for great taste dry the pieces in sun for 7 hours after which the pieces get shrunk thus keeping the seeds intact. After experiencing, my mother-in-law found out this method to enjoy the pieces along with the seeds. After 7 hours, bring the plates from sun to sprinkle the prepared spice powder. To sprinkle the spice powder evenly, use a strainer or a sieve. Ensure that the holes of the sieve are little bit bigger than the ordinary tea strainer. Take the spice powder into the strainer and sprinkle the powder evenly on to the pieces. This way each piece will get spice powder evenly. The salt in the spice powder will bring some moisture out of the pieces. This moisture helps the pieces to hold the spices. Take these plates and dry in sun for 3 to 4 days or till a piece when pressed between fingers will break easily. That means the pieces should be crisp. When done store them in a clean and dry bottle or jar. When required take some dried budam baddalu and fry them in oil as you fry the curd chilies. Heat a pan and add oil to it. When oil is hot add the dried budam baddalu and fry on low flame stirring. Fry the pieces till they are crisp and brown in color. When they are golden in color remove from the oil. They become dark in color after sometime as they get fried further with the heat retained. Serve thes budam baddalu with dals or any bland vegetables like bottle gourd, snake gourd or ridge gourd curries. When suffering from cold and fever eat these pieces with hot plain rice—they taste good. 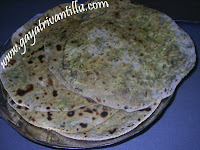 The budam kayalu look and taste like Dosakayalu (cucumber)—but they taste bitter when compared to Dosakayalu. When they become ripe they taste sour. 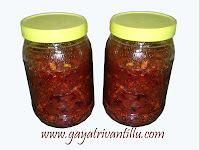 Here we have to use raw budam kayalu only for this recipe. The salt and spice when mixed with the pieces and dried in sun, removes the bitterness. The measurement of spices mentioned may be altered according to taste. Microwaving the carom seeds for few seconds make them crisp and the powder will be fine. Cut the pieces carefully so that the seeds remain intact. However some seeds will separate. Collect the separated seeds and dry them in sun. Fry these dried seeds in oil and add the spice powder to season them. Eat them with hot plain rice—they taste excellent. While arranging the pieces in plates place them side by side. Do not over crowd them by putting one over the other. Sprinkling the spice powder with a sieve will evenly spread it on all pieces. Dry the pieces in sun till crisp—that is, till a piece when pressed between fingers should break easily. Without drying properly if you store—after some time they get fungus and get spoiled. So take care to dry them well in sun. When required, fry the dried pieces in hot oil on low flame only. Fry the pieces till they are crisp and brown in color. When they are golden in color remove from the oil. They become dark in color after sometime as they get fried further with the heat retained.